In June 2018 WCRAG ran Towards a New Jerusalem workshops with celebrated author/illustrator Michael Foreman at Westminster Archives. Michael met children from twelve local schools and shared his stories of life during WW2 and in the immediate post war period. One of Michael's stories was about a community nurse, who cycled about his home town of Pakefield in Suffolk in the early years of the NHS. 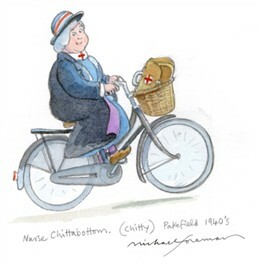 Nurse Chittabottom had a memorable name and Michael chose to print an image of her for each of the classes that visited Westminster Archives. They were encouraged to use their painting as a birthday card for the NHS at special assemblies marking the 70th anniversary of the NHS on the 5th July 2018. This page was added by Peter Daniel on 21/01/2019.